The Montessori School of Holmes Run (MSHR) is a private Montessori school in Falls Church, VA and was established in 1973. MSHR serves families in northern Virginia — including Vienna, Annandale, Burke, Springfield, Fairfax, Arlington, McLean, and Alexandria. Our school offers a comprehensive Montessori education for children between the ages of 2 1/2 – 6 (incl. Kindergarten). The Montessori curriculum is based on three-year cycles that provide consistent peers and mentors through each developmental period. New students are offered the support and example of returning students, and returning students grow from the chance to model and lead newer students. 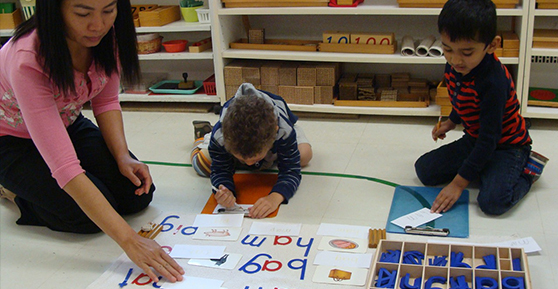 Our Montessori school in Falls Church, VA provides a quality Montessori program that is strong in academics while emphasizing tangible life-skills like collaboration, problem solving, self-expression and time management. The results are highly motivated, socially-adjusted, and academically inspired children who quickly develop a love of learning that will last for a lifetime. Students, parents, and staff form an interactive and caring base, working together to create a community which encourages and facilitates the academic, social, and emotional growth of the whole child. Begun as a co-op, parents help with preparing materials, chaperoning, and presenting aspects of their world to students throughout the year. This emphasis on parental involvement is a key component of our program. In addition, our active PTO offers opportunities for gatherings outside school hours. Please view our website and call or email for more information, to schedule a tour of our Montessori school in Falls Church, VA, or to learn how to apply. Visit the MSHR store on CafePress! Follow us on Facebook by clicking on the icon!